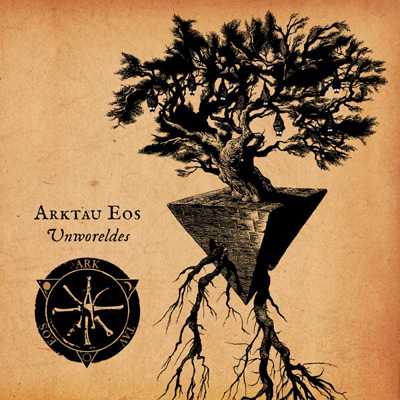 I was reviewing Arktau Eos last month, sharing my thoughts about their album ‘Ioh Maera’ that was released by Svart records at the same time this album, bearing the name ‘Unworeldes’ came out. Arktau Eos drew up their shamanic sleeves and conjured twin albums, with ‘Ioh Maera’ being available on CD only, and ‘Unworeldes’ being available on Vinyl only. Let’s not chat about whether only vinyl is real or not, but in ‘Unworeldes’ we receive a different current of sound magic that should be discussed. On ‘Geometry of Emptiness’, for example, the lyrical undertones that sound somewhere between a distant Gregorian chant and a dark, moist drone are being carried by vague, almost mute, tribal beats that make you flow into a short trance. There is a slow, muddy marsh of an ambience in this recording, and Arktau Eos is infusing it into the blood with rhythmic percussion on one part, high pitched distortion on another part, and I could go on and on about technical details, but in the end the important thing is the holistic experience in which these dark forest dwellers perform their ceremony of spiraling ascension through sadness. So far, every ceremony by Arktau Eos that I have heard was powerful and intense. Svart records are offering two different gatherings conducted by this project. Don’t settle for less than that.